From time to time we come across wedding hire companies disposing of their own cars due to retirement, change of circumstances, etc. Most of the cars listed below, (unless stated otherwise), are not actually in our ownership and may be in other areas of the country, so we list their availability on behalf of other companies that we have become acquainted with in the UK. If you are a wedding car hire proprietor within the British Isles and think you may be interested in listing surplus cars on the site, or if you will have cars coming available in the next few months, please contact us. Similarly if you are looking for suitable cars, fill in the enquiry form at the end of the page to register your possible interest in any cars as they become available. If you would like to be automatically updated regarding our wedding cars for sale pages, then subscribe to our RSS Feed. If you are unsure what RSS Feeds are about, then click here for help. 1967 Vanden Plas Princess DM4 - 7 passenger limousine, re-trimmed ivory leather interior a couple of years ago, carpets renewed in burgundy with ivory piping around the edges and new cloth headlining. Bodywork extremely good, engine has good oil pressure. Very well presented car ready to go straight to work on weddings. 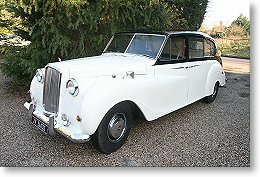 Keep up to date when wedding cars become available!! If you would like to be informed when cars become available then fill out your name and e-mail address below.